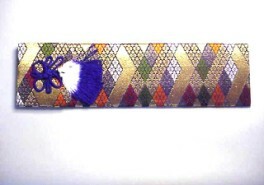 Below are some examples of Japanese items that do not fit into the categories to the left and/or garment related items that are available in such limited quantity that I choose not to make separate pages for them. 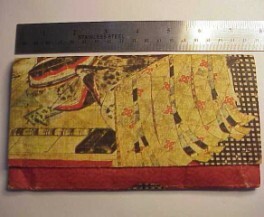 This page will also display examples of Ukiyoe, Abuna, Abunae (when still appropriate), any vintage flags, kites, or banners I may acquire, as well as odds and ends of exceedingly unusual nature. 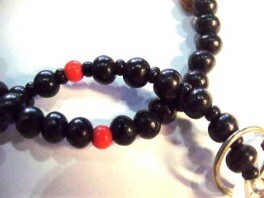 If the area below is empty, please keep checking, and also subscribe to the newsletter so you can be informed in advance of the arrival of items like these. 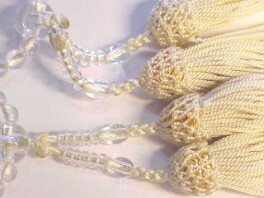 Kanzashi displayed here are usually from my own collection; my hair will never again be long enough to use them, so I'm offering them to you! 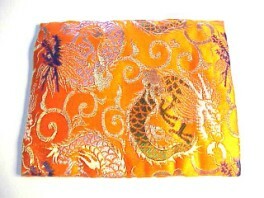 Japanese Altar Cloth w/Original Box JM103. 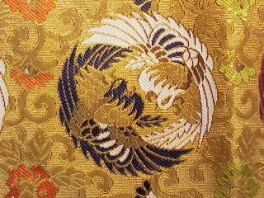 Pattern: Brocaded silk in gold, black, rust-red, green etc on the face, white rinzu on back. 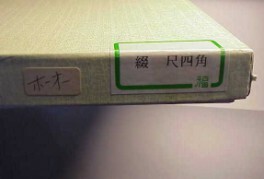 Comments: Original box has some damage as shown, but the cloth itself is perfect; I don't think it was ever used at all. 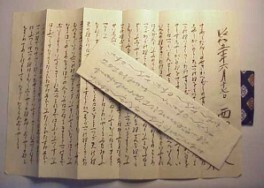 Japanese Wedding Letters w/Case, Blue JM102. 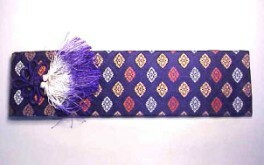 Pattern: Case is silk brocade over (most likely) cardboard, purple and white tassels, still in plastic cover sleeve. 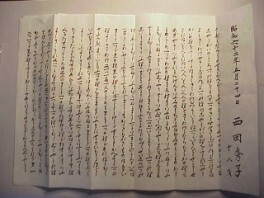 Comments: Four pages of kanji on soft paper; maybe washi or cotton rag paper. 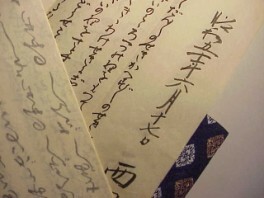 Japanese Wedding Letters w/Case, Gold JM101. 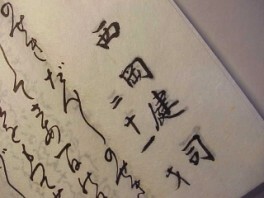 Comments: Two pages of kanji on soft paper; maybe washi or cotton rag paper. 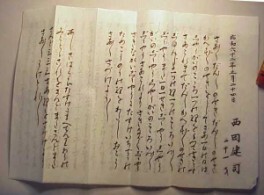 Japanese Wedding Letters w/Case, Peach JM100. 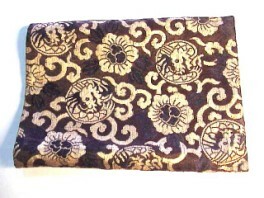 Japanese Case, Pouch for Juzu, Mala, Nenju Prayer Beads JM99. 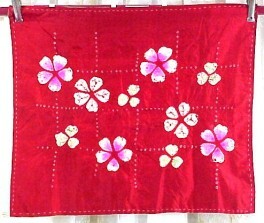 Pattern: I don't quite understand what I am looking at on this one; seems to be a banner flag in the foreground, then what looks like stationery and a covered container. 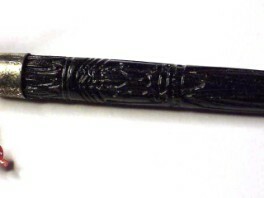 Left of center near the edge there is a tapered black square that looks like a block of ink for calligraphy. 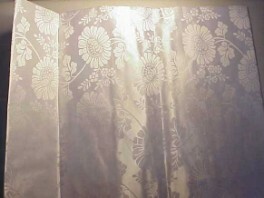 The main background is windowpane check. 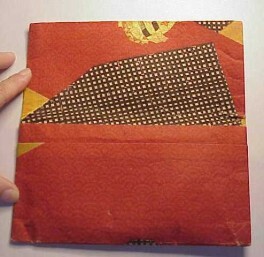 Comments: I'm listing it as rag paper because it feels like starched washi paper; in other words, it feels as much like cloth as like paper so I'm not certain which way to go with that. 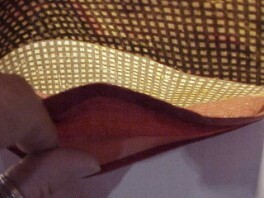 There is some edge wear along the bottom fold; nothing that goes through. 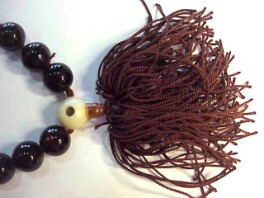 Japanese Juzu, Nenju, Mala Buddhist Prayer Beads JM98. 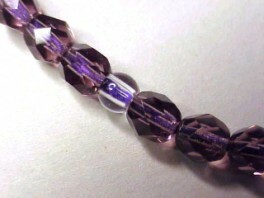 Pattern: Purple faceted oval glass beads with clear round glass bead stations, clear glass central bead and heavy purple tassel. 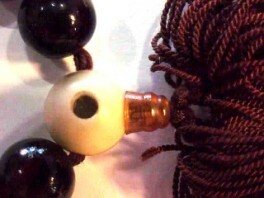 Comments: Unusual in that the beads are oval and faceted instead of the usual clear and round. 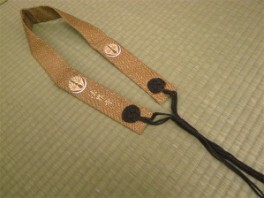 Really very attractive juzu. 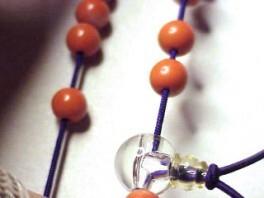 Stringing is firm with no gaps. 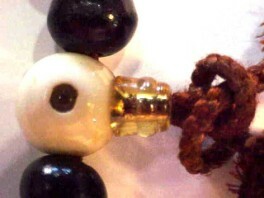 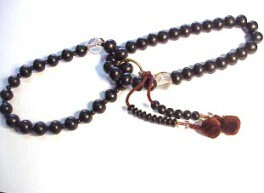 SOLD Japanese Juzu, Nenju, Mala Buddist Prayer Beads JM97. 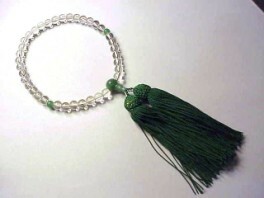 Pattern: Clear glass beads with jade green glass stations, jade green glass central bead and heavy green tassel. 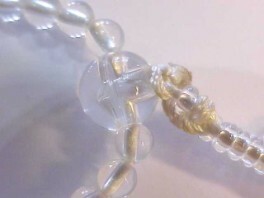 Comments: Firmly strung with no gaps, slightly larger beads than on most informal glass strands. 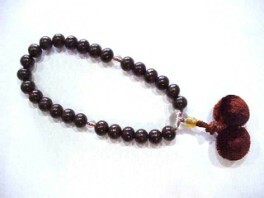 Japanese Juzu, Nenju, Mala Buddhist Prayer Beads JM96. 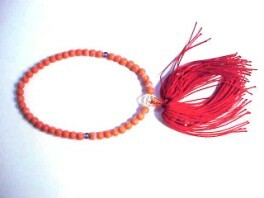 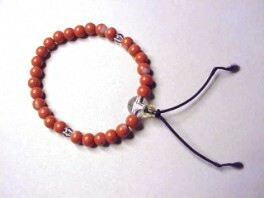 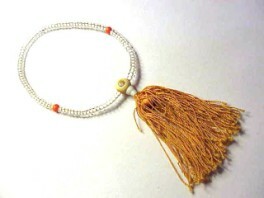 Pattern: Clear glass beads with bright orange stations and lighter, golden orange tassel. 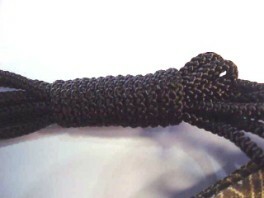 Comments: Stringing is firm with no gaps. 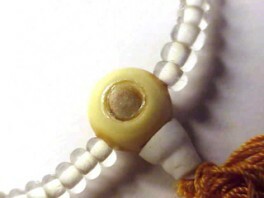 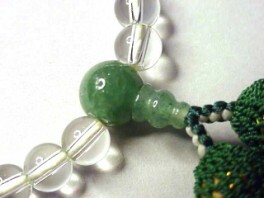 Central bead has a clear inner bead as shown in the photos. 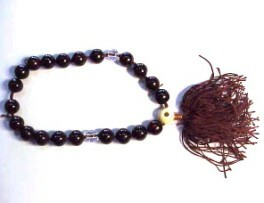 Japanese Juzu, Nenju, Mala Buddist Prayer Beads JM95. 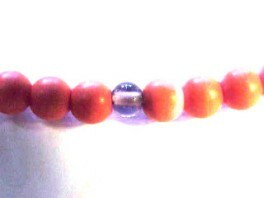 Pattern: Plain coral to orange ceramic beads with clear glass stations. 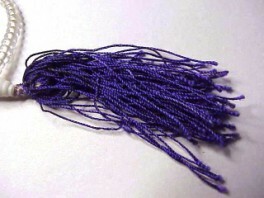 Comments: These are strung on purple elastic cord. 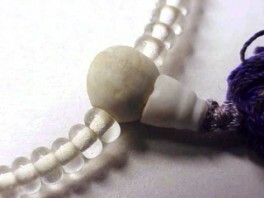 It is my opinion that the beads are older and have been more recently restrung on this elastic cord. 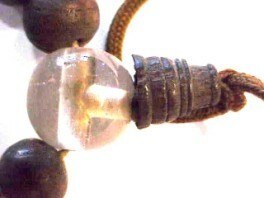 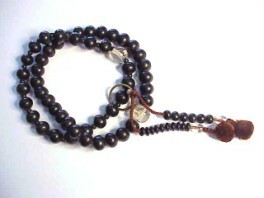 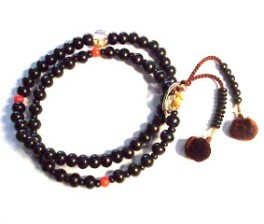 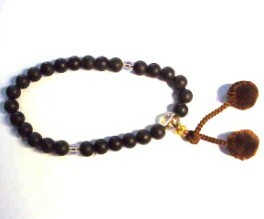 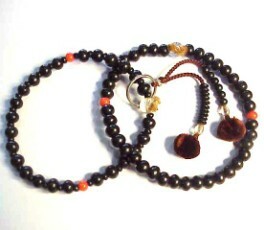 SOLD Japanese Juzu, Nenju, Mala Buddhist Prayer Beads JM94. 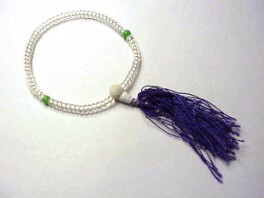 Pattern: Clear glass beads with opaque green glass stations and purple tassels. 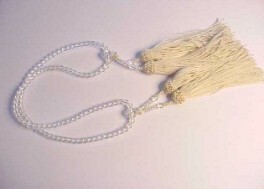 Comments: The central bead above the tassel seems to be unglazed porcelain, but might be ceramic. 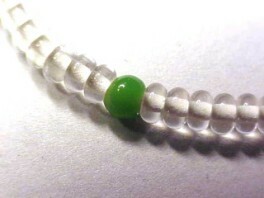 Stringing is still pretty firm; no gaps between beads. 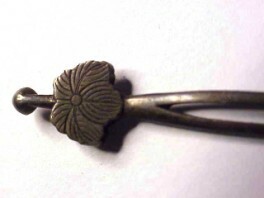 Japanese Hair Ornament Kanzashi HA212. 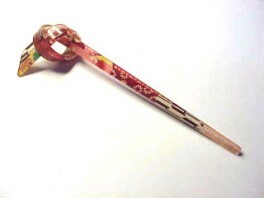 Pattern: Paulowina crest at the top of this spoon-tipped kanzashi hair fork. 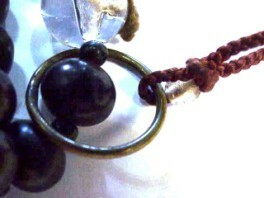 Comments: Cleaning or not is a matter of preference; I like the patina but that's just me. 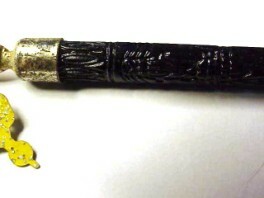 This one smells like possibly nickel or a low grade silver like .85 but there are no markings that would substantiate that. 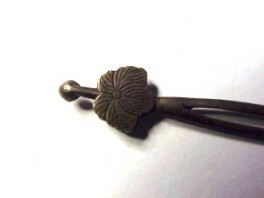 Japanese Hair Ornament Kanzashi HA211. 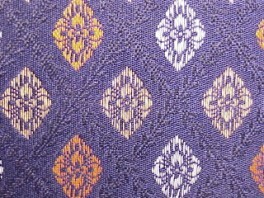 Pattern: Stylized chrysanthemum with alternating heart petals. 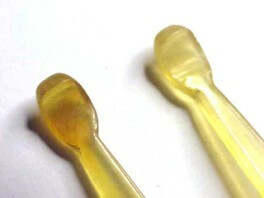 Spoon shaped top. 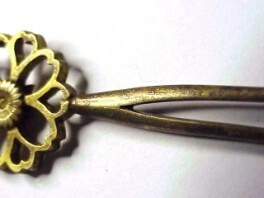 Comments: Base metal with brass flashing, nearly as I can tell. 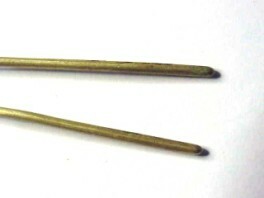 The flower part, top and higher region of the fork are still strongly brass colored while the lower portion of the fork is the color of old steel. 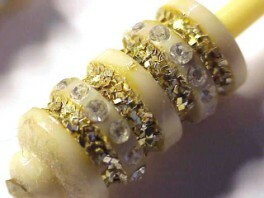 Older kanzashi fork, well worth the price. 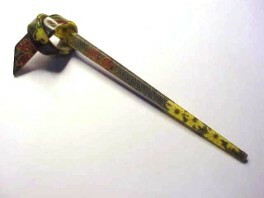 Japanese Hair Ornament Kanzashi HA210. 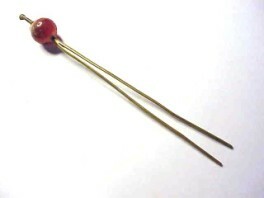 Pattern: Graduated red glass ball on base metal fork with spoon shaped top. 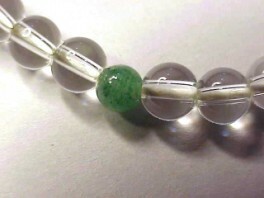 Older piece. 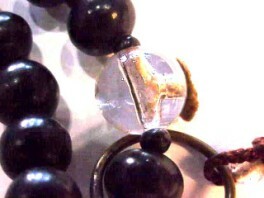 Comments: The ball has been fractured at the very top as shown in the pictures. 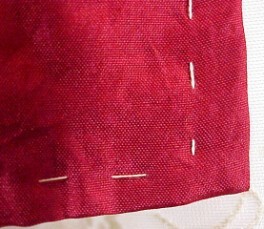 This could be lined up and glued after gently cleaning the surrounding area. 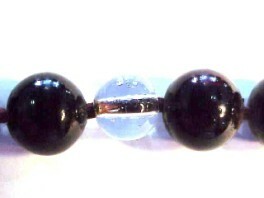 It feels like the ball has been broken vertically and reglued; I've priced it accordingly because I couldn't bring myself to discard it. 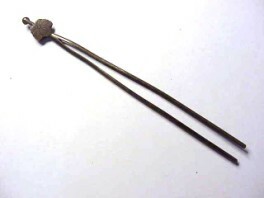 I'm not sure of the content of the base metal part. 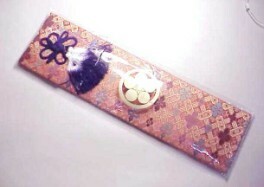 SOLD Japanese Hair Ornament Kanzashi HA209. 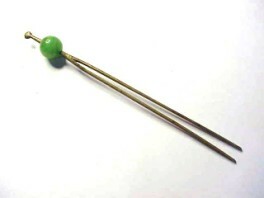 Pattern: Green glass ball or marble on silver color base metal fork. 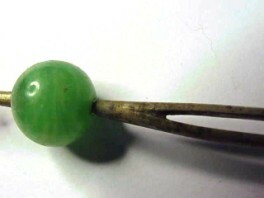 The ball turns freely on the shaft and the top of the shaft is spoon shaped. 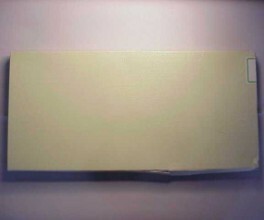 Older piece. 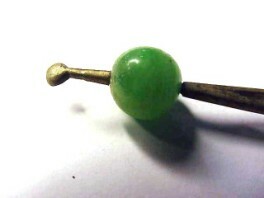 Comments: I'm listing this as base metal because I'm not exactly sure what it is. 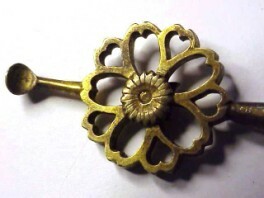 Smells like nickel but may be something else entirely. 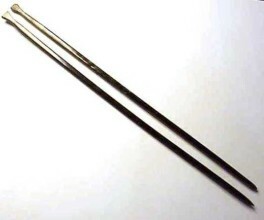 Some darkening of the fork a bit lower than the midway point may come out with vigorous polishing if you are bothered by it. 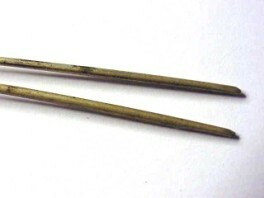 Japanese Hair Ornament Kanzashi Pair HA208. 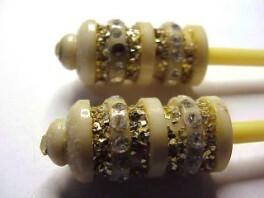 Pattern: Clear rhinestones on tops of ivory colored round shafts; VERY pointed tips. 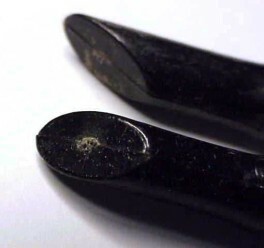 Comments: I see one missing rhinestone; this shouldn't be a problem to replace if it bothers you, but it's not very noticeable when the sticks are worn and it would be easy to hide the missing stone by simply turning that side away from prying eyes. 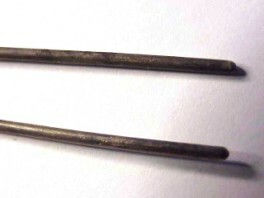 Need a bit of damp cloth cleaning if you like and I feel that this is an older pair too; possibly 50's or early 60's. 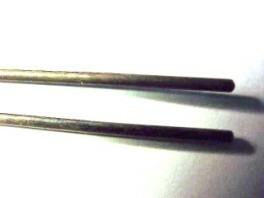 Japanese Hair Ornament Kanzashi Pair HA207. 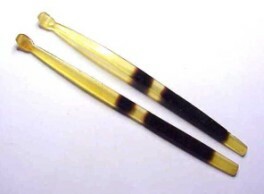 Pattern: I believe these are made to emulate tortoise shell; I think they are plastic but not going to do a hot needle test to find out. 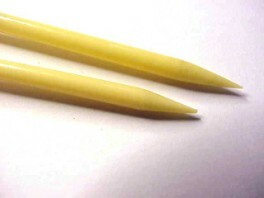 Rounded square 'points' and spoon shaped tops. 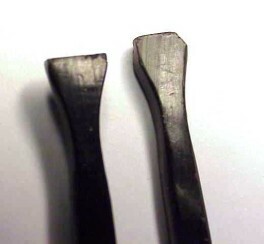 Comments: Older pair with some edge wear as shown in the pictures; something about these makes me think they were shaped by hand. 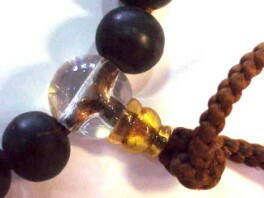 Color: Tortoise shell yellow/dark brown. 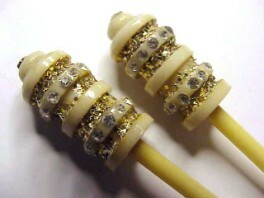 SOLD Japanese Hair Ornament Kanzashi Pair HA206. 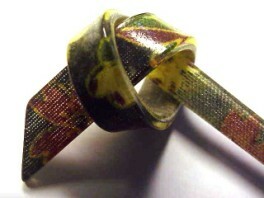 Pattern: Jointed pattern similar to bamboo with angled tops. 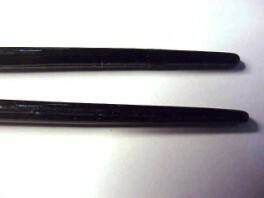 Comments: Excellent condition pair of sticks, black and simple enough to be casual or elegant. 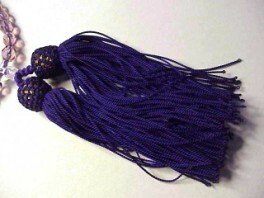 SOLD Japanese Hair Ornament Kanzashi HA205. 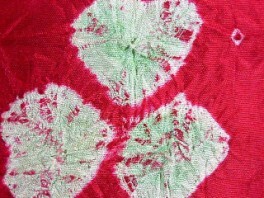 Pattern: Flowers and checks on pink/red ground. 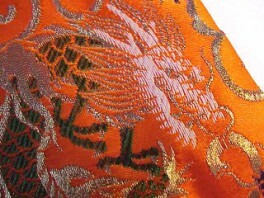 Comments: This is supposed to be kimono fabric coated with some sort of plastic or resin to make it rigid. 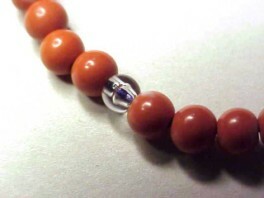 While still slightly flexible, it is more than strong enough for its use. 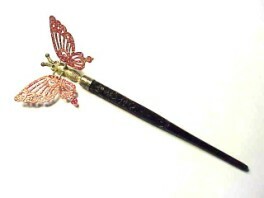 Purchased for my own collection around six or seven years ago. 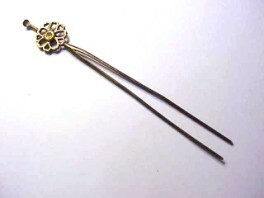 Japanese Hair Ornament Kanzashi HA204. 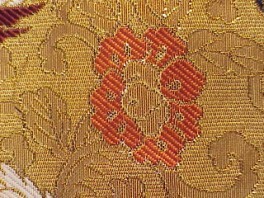 Pattern: Pattern of yellow and dark red flowers with green on black ground. 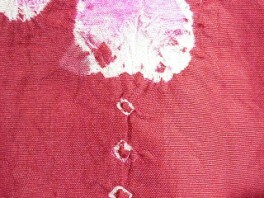 Comments: This is supposed to be kimono fabric coated with some sort of plastic or resin to make it rigid. 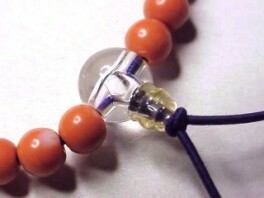 While still slightly flexible, it is more than strong enough for its use. 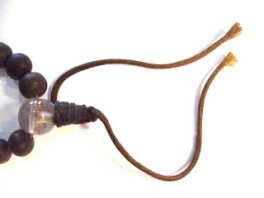 Purchased for my own collection around six or seven years ago. 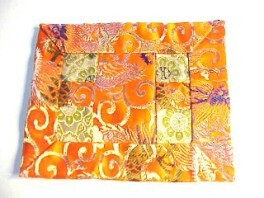 This is supposed to be kimono fabric coated with some sort of plastic or resin to make it rigid. 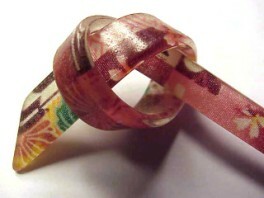 While still slightly flexible, it is more than strong enough for its use. 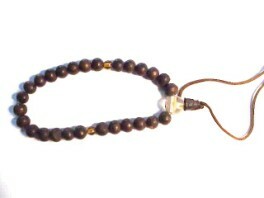 Purchased for my own collection around six or seven years ago. 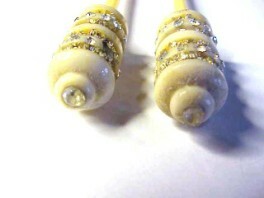 SOLD Japanese Hair Ornament Kanzashi Pair, Horn? 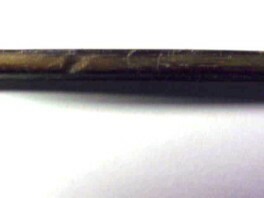 HA203. 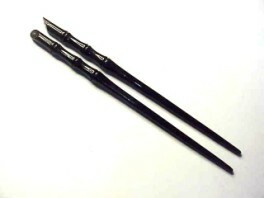 Pattern: Simple straight pair of sticks with tapered throats just below the heads. 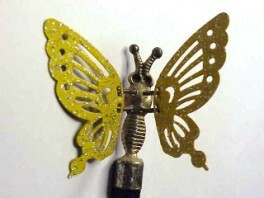 These are quite long, being 9 1/2" and seem to be shaped by hand rather than machine. 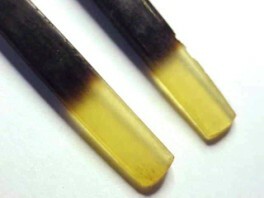 Comments: Tip is damaged on one, as shown in the photos. 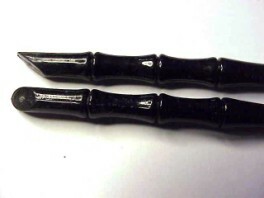 These could be some sort of plastic, but they might also be some kind of horn. 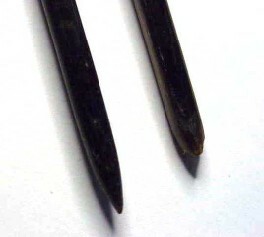 The two are not precisely identical; one is somewhat thicker and the shapes of the heads are slightly different from each other. 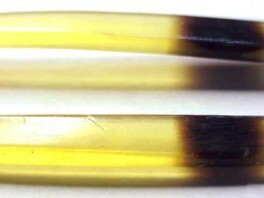 Also, one is more scratched than the other and is a different color when viewed sideways. 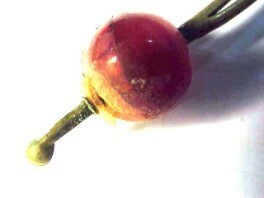 I believe these to be quite old but have nothing to support that beyond my own feeling. 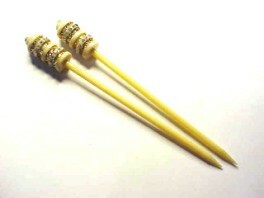 SOLD Japanese Hair Ornament Kanzashi, Yellow Cho Cho HA202. 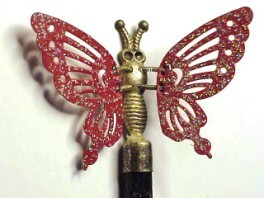 Pattern: The metal butterfly wings are on tiny, tightly coiled springs so that the wings tremble and move with the slightest provocation. 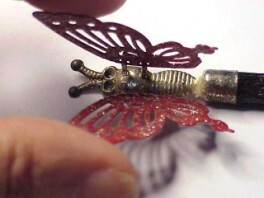 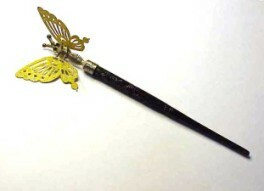 The shaft is a plastic of some sort and has carving work, as does the metal cap just below the butterfly. 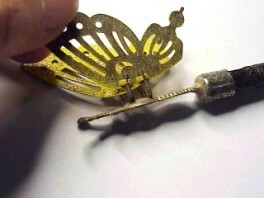 Comments: This item may need cleaning, but it is in good condition with no damaged or missing parts. 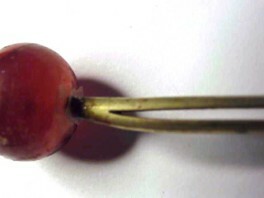 Probably not more than ten or fifteen years old, but very pretty. 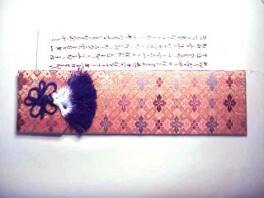 SOLD Japanese Hair Ornament Kanzashi Red Cho Cho HA201. 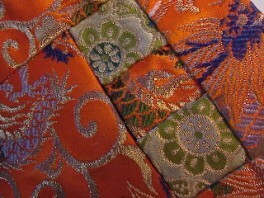 Pattern: Woven brocade, multicolors on orange. 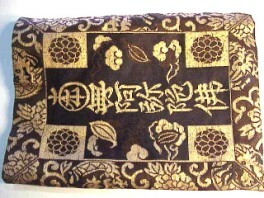 Size: 6 3/8" x 5"
Pattern: Woven pattern of dragons on one side, kanji on the other. 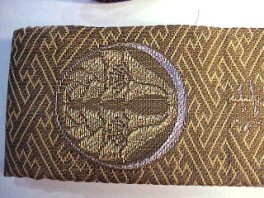 Comments: Dark brown and metallic gold, gold fabric liner. 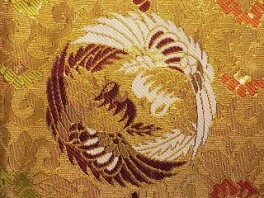 Pattern: The crest is "Embracing Apricot leaf" and the temple says "Houkaiji." 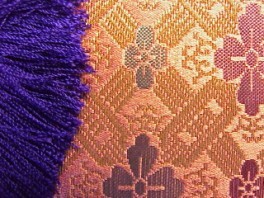 Comments: Simple ornamental cloth for a Buddist; some men wear it with daily-wear kimono. 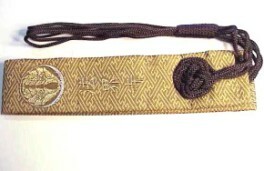 In excellent condition with the original package, the han-kesa is reminiscent of a priest's surplice. 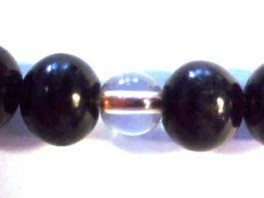 Pattern: Nearly black wood with small spacer beads between and glass separator beads. 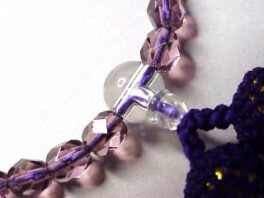 Comments: Two strands interconnected, beaded pompom cords depending from metal ring. 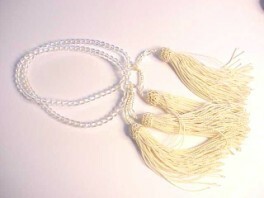 Pattern: Long strand of clear glass beads with two pairs of tassels. 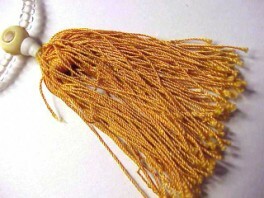 Comments: Tassel cords are beaded. 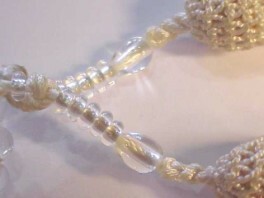 Can be doubled with a twist. 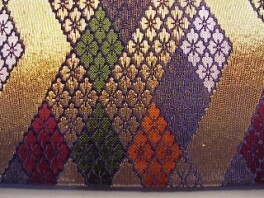 Pattern: Two strands interconnected. 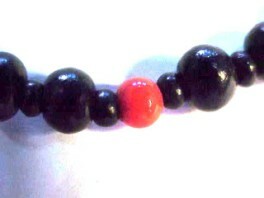 Dull, smooth wooden beads with bright red/orange and clear separator beads. 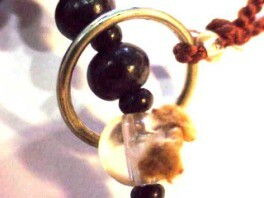 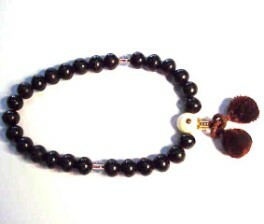 Comments: Brown pompoms trailing from bead strand pair depending from metal ring. 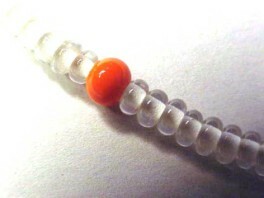 Pattern: Orange glass or ceramic beads with glass or plastic separator beads. 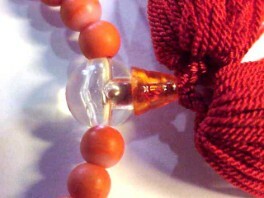 Comments: Red tassels knotted together at large separator bead. 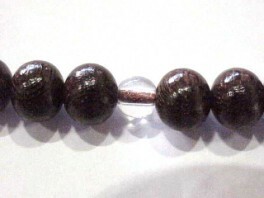 Pattern: Old dull dark brown wooden beads with glass separator beads. 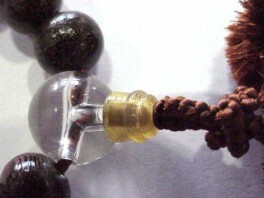 Comments: Brown cord tails and conical bead at large separator bead. 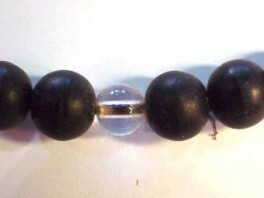 Pattern: Polished beads (material uncertain; feel like glass) with glass separator beads; large separator bead may be plastic. 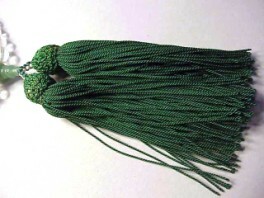 Comments: Brown tassels at large separator bead. 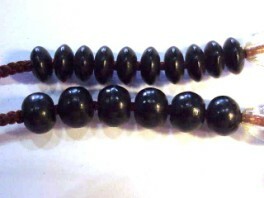 Pattern: Dark wooden beads with glass separator beads; large separator may be plastic. 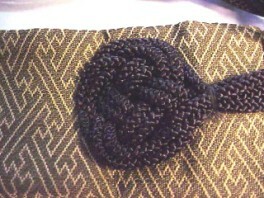 Comments: Brown pompoms knotted together at large separator bead. 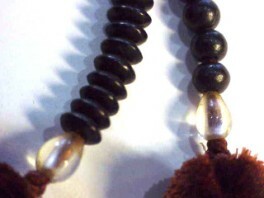 Pattern: Dull, dark wooden beads with glass separator beads. 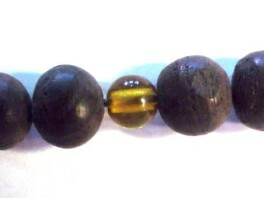 Pattern: Polished wooden beads with glass separator beads. 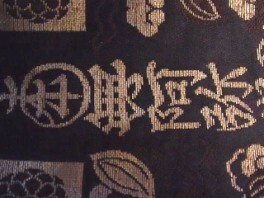 Antique Kimono Kujaku Furoshiki Shibori Kanji. 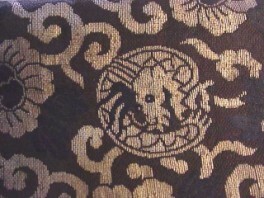 This is either kujaku or a small furoshiki. 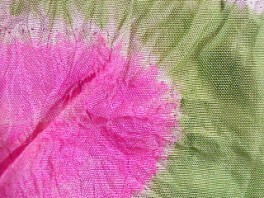 As you can see from the pictures it is beautifully double sided, with the red side not quite preparing you for the amazing green and pink of the reverse. 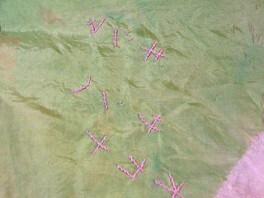 The green/pink side has embroidered kanji in one corner; I assume this to be either signature or message from the person who made this piece. 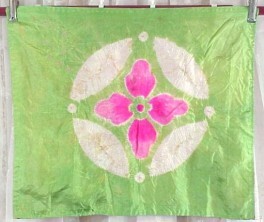 The silk is in excellent condition on both sides; the green/pink side has a vague faint stain (photographed second right) that does not detract from the overall presence of the piece. 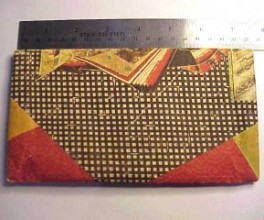 It measures 20 1/2" x 17 1/2" and it is $25.00. 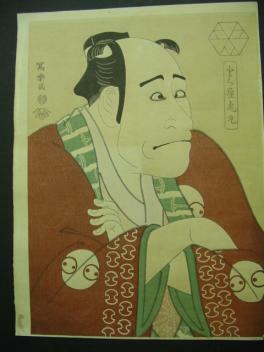 Vintage Japanese Ukiyoe, Kabuki Actor on Sand Color Ground. 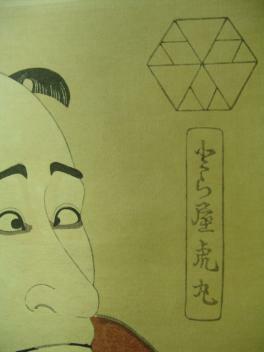 This is a 1930's repaint of another of Toshusai Sharaku work; the original was done in 1975. 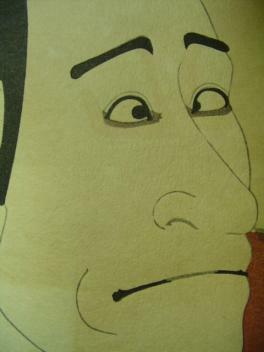 Once again, we have a Kabuki actor with an exaggerated expression of what could be impatience. 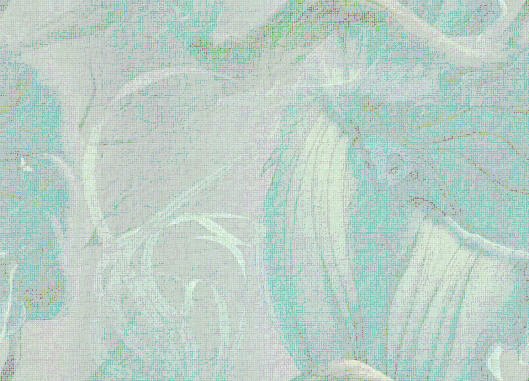 As visible in the picture upper left as well as the picture lower left, there is an area that is lighter than its surroundings, which would indicate that something was placed on top of the picture and left there for quite some time. 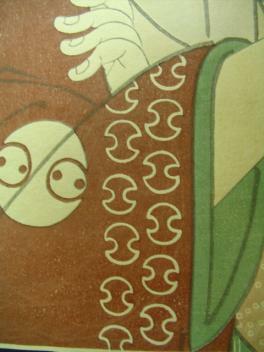 Again, there are some smudges to the bordering on the front, some browning to the back, and an area at the very bottom right corner where some of the dark red paint went astray. 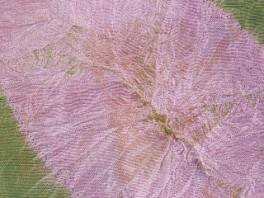 I don't believe that any of that interferes with the "presentability" of the piece. 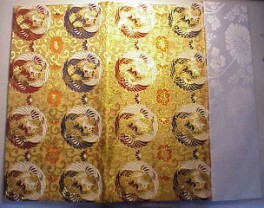 It measures 8 7/8" x 12", and is $25.00.